It seems like Spring is starting almost everywhere, but in Montreal, we're not quite there. Today is blustery and below freezing. I contemplated taking the bus home from my yoga class, even though I walked all winter. A few warmer days make these colder ones hard to bear. The snow is mostly gone, but the ground is still frozen. 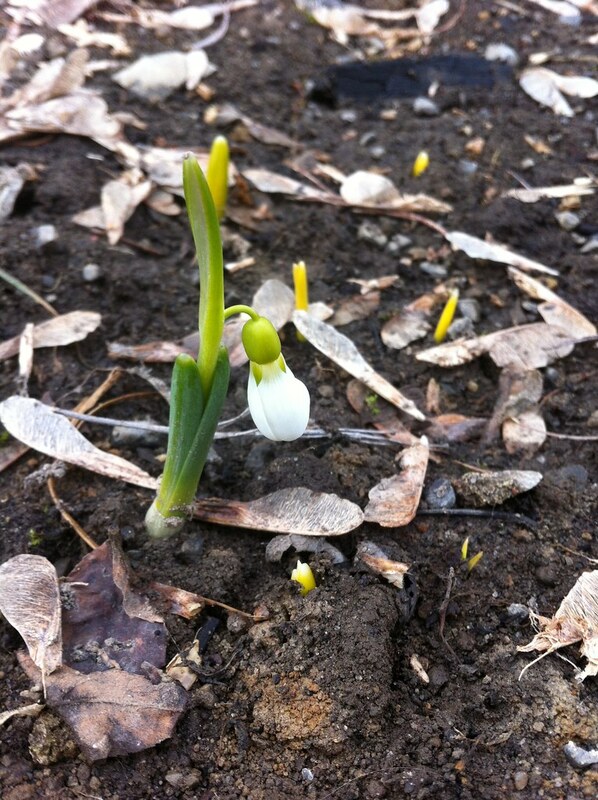 All I have are a couple lonely snowdrops, which I planted last fall. The gardener inside me is bursting to be out, busy and dirty and tired at the end of the day. Thankfully, I have many things inside to keep me busy. For knitting, I am trying to finish up the last part of the mystery KAL, have a light cardigan about 1/2 done, and have started a new pair of socks (because even if spring comes soon, my feet will be cold for a couple months yet). I hope everyone else is enjoying some Spring weather (or cooler days of Autumn, if you live in the south). Posted by Barbara Prime at 3:05 p.m.